As the mother of a two-year-old, I can tell you – it’s not easy to plan meals that appeal to both adults and toddlers. Actually, that’s not true. My husband and daughter would be more than happy to have macaroni and cheese and hot dogs every other night. I, on the other hand, would prefer a little more pizzazz in my menu. One way I’ve found to accommodate both palates is to take the main ingredient and prepare it in two different yet simple ways. 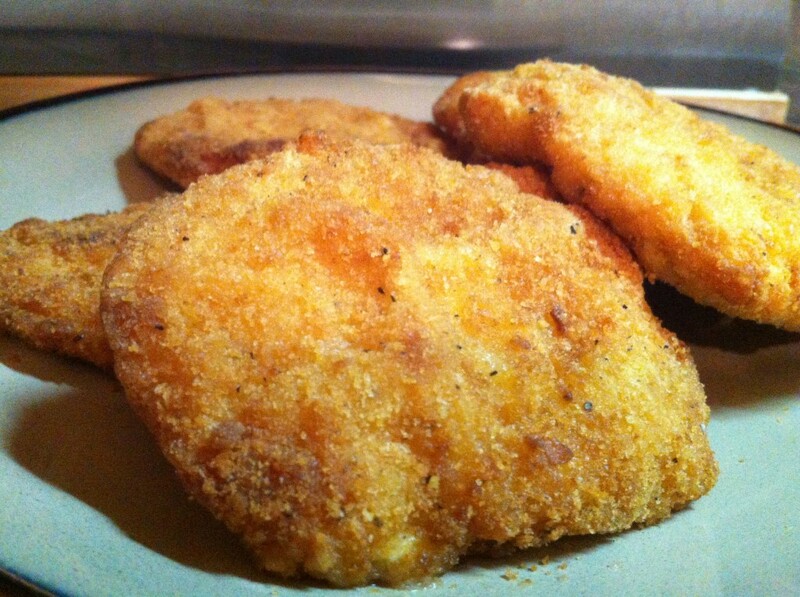 And one ingredient I’ve recently discovered that makes that process extremely easy is Tyson Crispier Breaded Chicken Filets. 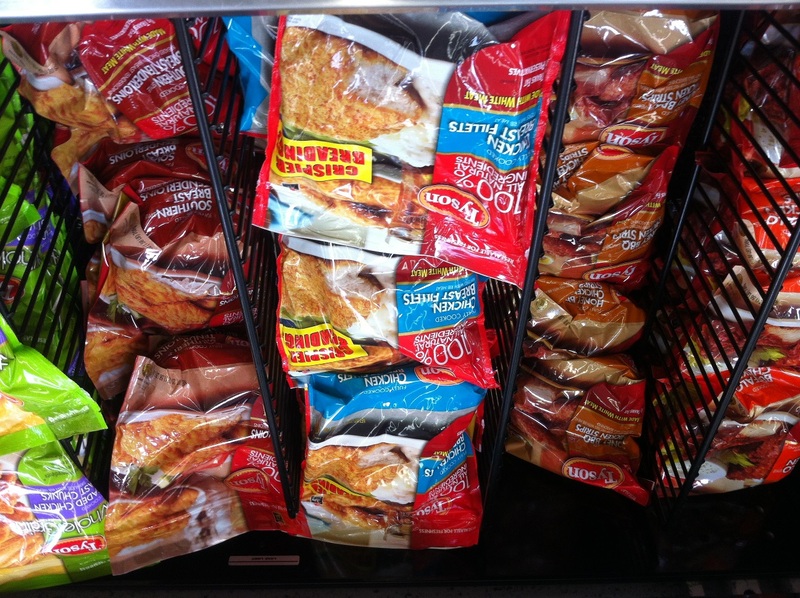 We bought these frozen filets at Walmart after watching an in-store demo and a taste test of the product (you can see my entire shopping trip here). Apparently it’s frowned upon to stand at the demo all day, snacking. As tempting as it is, don’t do that. 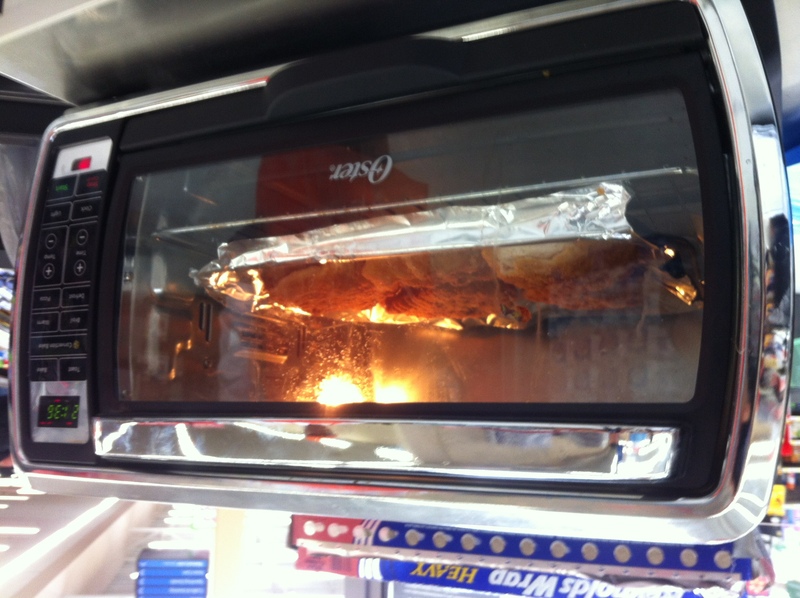 Check out the chicken cooking during the demo. Oh yeah! I waited to taste it! It was a tasting, after all. My plan: To bake the breaded filets and cut them into French fry-like strips for our little one (including a variety of dipping sauces for her), and to add the Tyson Chicken Filet as a topping on salads for mom and dad. Overall, I was really impressed with the filets. They looked delicious even while still frozen, and looked (and smelled) even more delicious after spending about 20 minutes in the oven. Our diva’s dinner was a cinch to prepare. We just carved the filets into strips, cooked a veggie for the side, and gave her a choice of three different chicken-friendly dipping sauces: barbeque sauce, honey mustard and ranch dressing. The “grown up” dinner was equally easy. We prepared salads with some shredded cheddar cheese, croutons, and ranch dressing and topped with one of the Tyson Crispier Filets sliced into three pieces. All in all, the Tyson filets were de-licious! True to their word, they were very crispy, which isn’t something you normally see in a frozen breaded filet. They were also juicy – again, not what you’d expect from a product like that – but I’ve prepared Tyson chicken products in the past, and they’ve always been juicy, so I shouldn’t have been surprised. And how’d they taste? Let’s just say, I’ve already got another bag of these filets in my freezer and I’m already thinking of ways to prepare them for our next kid-friendly/adult-friendly #mealstogether. And now for the true test. What did our two-year-old think of the Tyson Chicken? She immediately dipped it in the barbeque sauce and loved it. Next, she dipped it in the ranch dressing and, again, loved it. She wasn’t that crazy about the honey mustard, but that was no fault of the chicken filets! If you like what you’ve seen, feel free to follow Tyson on Twitter (@TysonFoods) or on Facebook. Looks like your little one loves them! My daughter can’t eat these because she’s allergic to dairy, but I think they are pretty yummy! Oh no! Someone needs to invent a non-dairy breading! 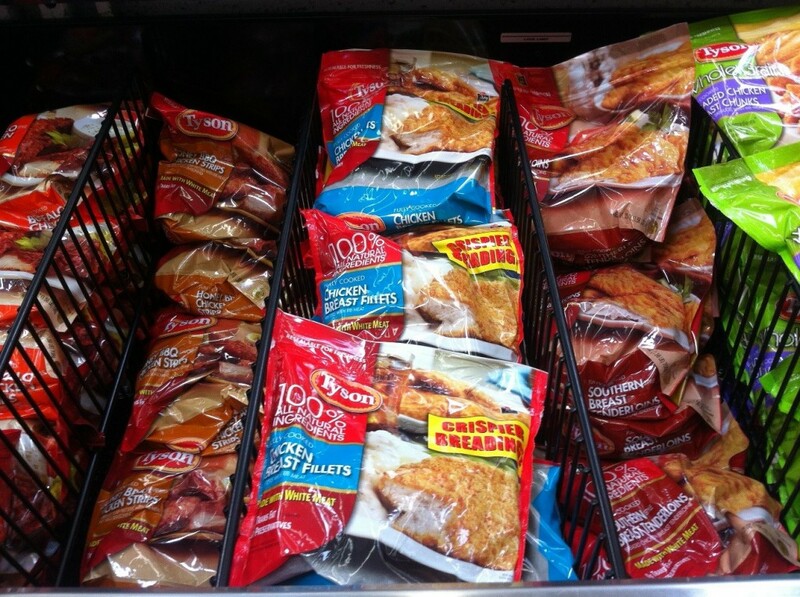 FYI…The Tyson Chicken Breast Fillets, Crispier Breading UPC Bar Code #23700 01411 does not contain Milk. I like how you made two different meals with it! Pretty cool. OK. Now MY mouth is watering. I made chicken sandwiches, but not with all those great toppings! Now I gotta go buy more to try these! love the different ideas! my kids are also very very picky! This is actually one of my favorite ones! Especially, since I had coupons for them lol. Have you tried them yet, David? Let me know what you think! What great ideas. My kids are the terrible eaters so these are great suggestions. Thank you! Oh yeah! I made the salads, dipping strips for the diva and chicken sandwiches so far. All very good! Thank you for your wonderful review. My kids love Tyson chicken. Great meal idea! 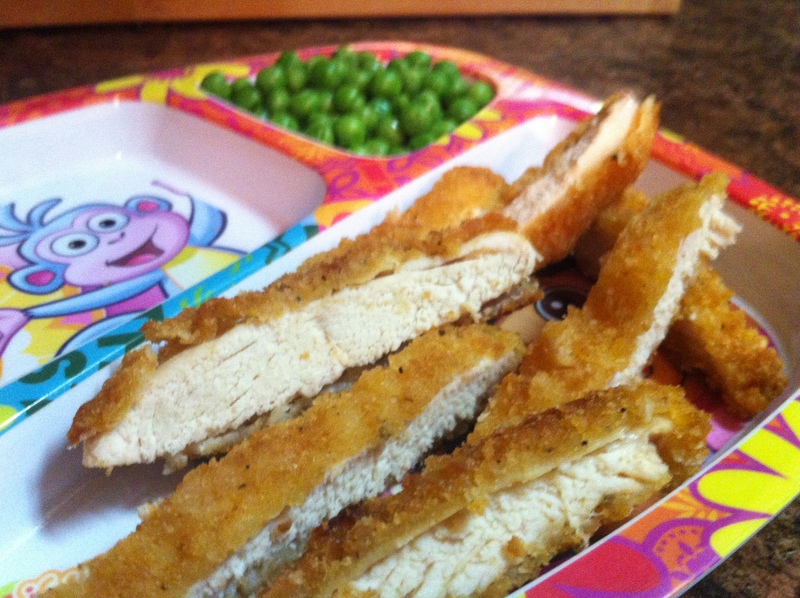 My son loves Tyson chicken, so it’s great to have ideas for how I can turn it into a meal for the entire family! I know what you mean by the freezer-burt taste. These didn’t have that at all and the breading certainly wasn’t soggy! You definitely should try them! Brilliant idea! We try to keep Tyson Chicken Nuggets on hand. Oh their nuggets are good too! I really enjoyed these in a salad and tried it in a sandwich too. So good! Crispy but not at all greasy! I’ve never thought to put those in a salad but will definitely be trying it! They look good and my kids love chicken anything! I was hesitant to do the salad, but it really was delicious! It really is! No more soggy breading! I LOVE Tyson chicken! YUM! Well, now I know what’s going on next week’s shopping list! Thanks! Those look SOOO good! The meat looks nice and white and they look juicy! 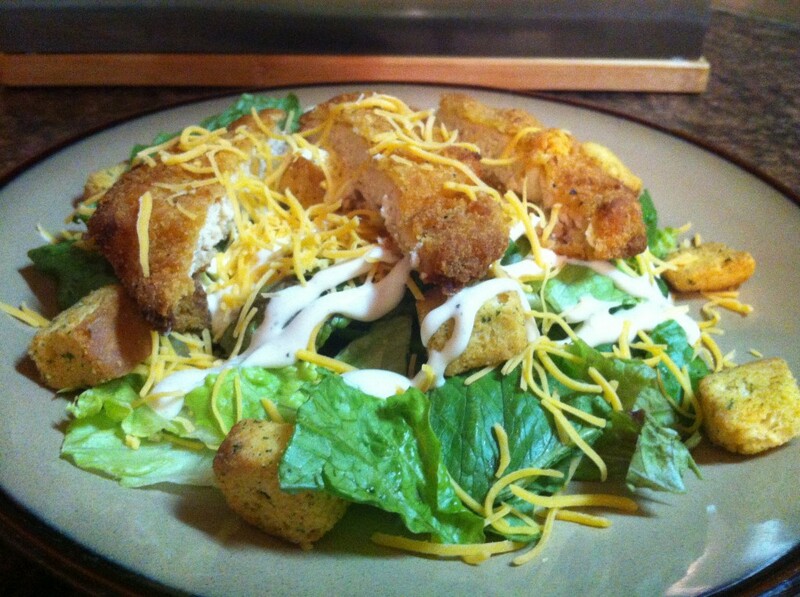 I love how the idea of the salad… now I think I will make that for myself soon! Thanks for sharing! I’m not a fan of frozen chicken, but I think I would actually like the salad!! 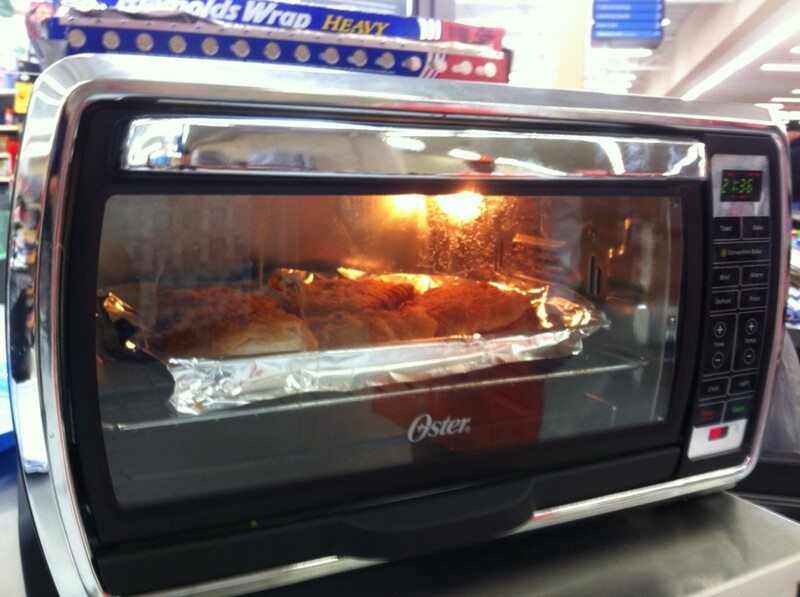 I love Tyson Chicken its so good. My kids loved it as well. All those dipping sauces! The Diva has it made! Loved your post. Your chicken made me hungry also..
Great idea to make it kid-friendly and tasty for adults too! Nice job! Your daughter really seems to like them! Love how you cut these up to make them easy to eat!